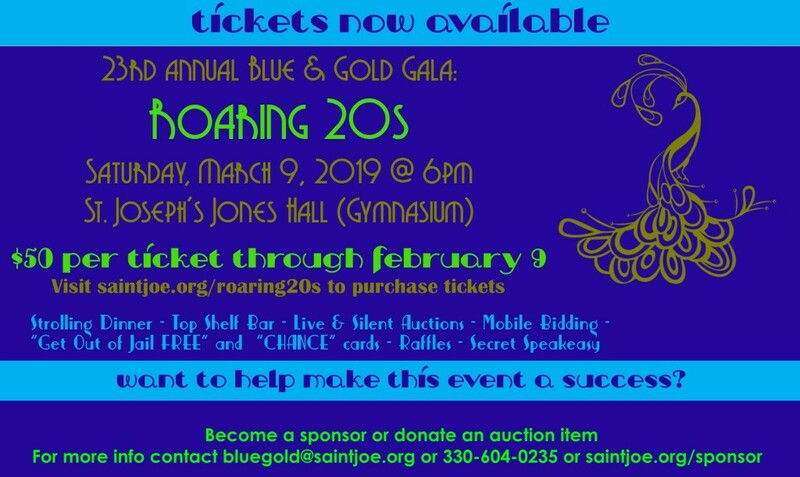 Please Join Us on Saturday, March 9 at 6 pm in Saint Joseph Parish School Jones Hall (Gymnasium) for Blue and Gold 2019:The Roaring 20s. Cost PER TICKET is $50 if purchased by February 9. Price per ticket will be $60 beginning on February 10 through March 4. Please complete all fields below, then click "continue to payment." After your payment has been processed, you will receive an email confirming your transaction. This email acts as your receipt and tickets for the event. PURCHASE TICKETS BY February 9 AND SAVE $10. BEGINNING FEBRUARY 10, TICKETS ARE $60. Names of Guests for which you are paying. Please include first and last names.